Palantir Technologies is a private American software company that specializes in big data analytics. Headquartered in Palo Alto, California, it was founded by Peter Thiel, Nathan Gettings, Joe Lonsdale, Stephen Cohen, and Alex Karp. The company's name is derived from The Lord of the Rings: a palantír is an artifact used to communicate with or see faraway parts of the world. The company is known for three projects in particular: Palantir Gotham, Palantir Metropolis and Palantir Foundry. Palantir Gotham is used by counter-terrorism analysts at offices in the United States Intelligence Community (USIC) and United States Department of Defense, fraud investigators at the Recovery Accountability and Transparency Board, and cyber analysts at Information Warfare Monitor, while Palantir Metropolis is used by hedge funds, banks, and financial services firms. Palantir Foundry is used by corporate clients such as Morgan Stanley, Merck KGaA, Airbus, and Fiat Chrysler Automobiles NV. Palantir's original clients were federal agencies of the USIC. It has since expanded its customer base to serve state and local governments, as well as private companies in the financial and healthcare industries. Karp, Palantir's chief executive officer, announced in 2013 that the company would not pursue an IPO, as going public would make "running a company like ours very difficult". That being said, an Oct. 18th, 2018 report by the Wall Street Journal was considering an IPO in the first half of 2019 following a $41 billion valuation. The company was valued at $9 billion in early 2014, with Forbes stating that the valuation made Palantir "among Silicon Valley's most valuable private technology companies". As of December 2014, Thiel was Palantir's largest shareholder. In January 2015, the company was valued at $15 billion after an undisclosed round of funding with $50 million in November 2014. This valuation rose to $20 billion in late 2015 as the company closed an $880 million round of funding. Palantir has never reported a profit, and in 2018 Morgan Stanley valued the company at $6 billion. Founder and chairman Peter Thiel was Palantir's largest shareholder as of late 2014. Though usually listed as having been founded in 2004, SEC filings state Palantir's official incorporation to be in May 2003 by Peter Thiel (co-founder of PayPal), who named the start-up after the "seeing stone" in Tolkien's legendarium. Thiel saw Palantir as a "mission-oriented company" which could apply software similar to PayPal's fraud recognition systems to "reduce terrorism while preserving civil liberties." 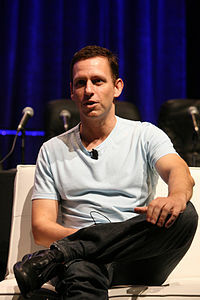 In 2004, Thiel bankrolled the creation of a prototype by PayPal engineer Nathan Gettings and Stanford University students Joe Lonsdale and Stephen Cohen. That same year, Thiel hired Alex Karp, a former colleague of his from Stanford Law School, as chief executive officer. Headquartered in Palo Alto, California, the company initially struggled to find investors. According to Karp, Sequoia Capital chairman Michael Moritz doodled through an entire meeting, and a Kleiner Perkins executive lectured the founders about the inevitable failure of their company. The only early investments were $2 million from the U.S. Central Intelligence Agency's venture capital arm In-Q-Tel, and $30 million from Thiel himself and his venture capital firm, Founders Fund. Palantir developed its technology by computer scientists and analysts from intelligence agencies over three years, through pilots facilitated by In-Q-Tel. The company stated computers alone using artificial intelligence could not defeat an adaptive adversary. Instead, Palantir proposed using human analysts to explore data from many sources, called intelligence augmentation. In 2009 and 2010 respectively, Information Warfare Monitor used Palantir software to uncover the GhostNet and the Shadow Network. The GhostNet was a China-based cyber espionage network targeting 1,295 computers in 103 countries, including the Dalai Lama’s office, a NATO computer and various national embassies. The Shadow Network was also a China-based espionage operation that hacked into the Indian security and defense apparatus. Cyber spies stole documents related to Indian security and NATO troop activity in Afghanistan. In April 2010, Palantir announced a partnership with Thomson Reuters to sell the Palantir Metropolis product as QA Studio. On June 18, 2010, Vice President Joe Biden and Office of Management and Budget Director Peter Orszag held a press conference at the White House announcing the success of fighting fraud in the stimulus by the Recovery Accountability and Transparency Board (RATB). Biden credited the success to the software, Palantir, being deployed by the federal government. He announced that the capability will be deployed at other government agencies, starting with Medicare and Medicaid. Estimates were $250 million in revenues in 2011. "[As of 2013] the U.S. spy agencies also employed Palantir to connect databases across departments. Before this, most of the databases used by the CIA and FBI were siloed, forcing users to search each database individually. Now everything is linked together using Palantir." A document leaked to TechCrunch revealed that Palantir's clients as of 2013 included at least twelve groups within the U.S. government, including the CIA, DHS, NSA, FBI, CDC, the Marine Corps, the Air Force, Special Operations Command, West Point, the Joint Improvised-Threat Defeat Organization and Allies, the Recovery Accountability and Transparency Board and the National Center for Missing and Exploited Children. However, at the time the United States Army continued to use its own data analysis tool. Also, according to TechCrunch, the U.S. spy agencies such as the CIA and FBI were linked for the first time with Palantir software, as their databases had previously been "siloed." In September 2013, Palantir disclosed over $196 million in funding according to a U.S. Securities and Exchange Commission filing. It was estimated that the company would likely close almost $1 billion in contracts in 2014. CEO Alex Karp announced in 2013 that the company would not be pursuing an IPO, as going public would make “running a company like ours very difficult.” In December 2013, the company began a round of financing, raising around $450 million from private funders. This raised the company's value to $9 billion, according to Forbes, with the magazine further explaining that the valuation made Palantir "among Silicon Valley’s most valuable private technology companies." In December 2014, Forbes reported that Palantir was looking to raise $400 million in an additional round of financing, after the company filed paperwork with the Securities and Exchange Commission the month before. The report was based on research by VC Experts. If completed, Forbes stated Palantir's funding could reach a total of $1.2 billion. As of December 2014, the company continued to have diverse private funders, Kenneth Langone and Stanley Druckenmiller, In-Q-Tel of the CIA, Tiger Global Management, and Founders Fund, which is a venture Firm operated by Peter Thiel, the chairman of Palantir. As of December 2014, Thiel was Palantir's largest shareholder. The company was valued at $15 billion in November 2014. In June 2015, Buzzfeed reported the company was raising up to $500 million in new capital at a valuation of $20 billion. By December 2015, it had raised a further $880 million, while the company was still valued at $20 billion. In February 2016, Palantir bought Kimono Labs, a startup which makes it easy to collect information from public facing websites. In August 2016, Palantir acquired data visualization startup Silk. Palantir Gotham (formerly known as Palantir Government) integrates structured and unstructured data, provides search and discovery capabilities, knowledge management, and secure collaboration. The Palantir platform includes the privacy and civil liberties protections mandated by legal requirements such as those in the 9/11 Commission Implementation Act of 2004. Palantir’s privacy controls purportedly keep investigations focused, as opposed to the expansive data mining techniques that have drawn criticism from privacy advocates concerned about civil liberties protection. Palantir maintains security tags[further explanation needed] at a granular level. Palantir previously ran the site AnalyzeThe.US, which allowed potential Palantir customers and affiliates to use Palantir Gotham to perform analysis on publicly available data from data.gov, usaspending.gov, the Center for Responsive Politics’ Open Secrets Database, and Community Health Data from hhs.gov. Palantir Metropolis (formerly known as Palantir Finance) was software for data integration, information management and quantitative analytics. The software connects to commercial, proprietary and public data sets and discovers trends, relationships and anomalies, including predictive analytics. Aided by 120 “forward-deployed engineers” of Palantir during 2009, Peter Cavicchia III of JPMorgan used Metropolis to monitor employee communications and alert the insider threat team when an employee showed any signs of potential disgruntlement: the insider alert team would further scrutinize the employee and possibly conduct physical surveillance after hours with bank security personnel. The Metropolis team used emails, download activity, browser histories, and GPS locations from JPMorgan owned smartphones and their transcripts of digitally recorded phone conversations to search, aggregate, sort, and analyze this information for any specific keywords, phrases, and patterns of behavior. In 2013, Cavicchia may have shared this information with Frank Bisignano who had become the CEO of First Data Corporation. The company has been involved in a number of business and consumer products, designing in part or in whole. For example, in 2014, they premiered Insightics, which according to the Wall Street Journal "extracts customer spending and demographic information from merchants’ credit-card records." It was created in tandem with credit processing company First Data. Palantir Metropolis is used by hedge funds, banks, and financial services firms. Palantir Foundry clients include Merck KGaA, Airbus and Ferrari. Palantir partner Information Warfare Monitor used Palantir software to uncover both the Ghostnet and the Shadow Network. Palantir’s software is used by the Recovery Accountability and Transparency Board to detect and investigate fraud and abuse in the American Recovery and Reinvestment Act. Specifically, the Recovery Operations Center (ROC) used Palantir to integrate transactional data with open-source and private data sets that describe the entities receiving stimulus funds. [clarification needed] Other clients as of 2019 included Polaris Project, the Centers for Disease Control and Prevention, the National Center for Missing and Exploited Children, the National Institutes of Health, Team Rubicon, and the United Nations World Food Programme. Palantir Gotham is used by counter-terrorism analysts at offices in the United States Intelligence Community and United States Department of Defense, fraud investigators at the Recovery Accountability and Transparency Board, and cyber analysts at Information Warfare Monitor (responsible for the GhostNet and the Shadow Network investigation). Other clients as of 2013 included DHS, NSA, FBI, CDC, the Marine Corps, the Air Force, Special Operations Command, West Point, the Joint IED Defeat Organization and Allies. However, at the time the United States Army continued to use its own data analysis tool. Also, according to TechCrunch, "The U.S. spy agencies also employed Palantir to connect databases across departments. Before this, most of the databases used by the CIA and FBI were siloed, forcing users to search each database individually. Now everything is linked together using Palantir." U.S. military intelligence used the Palantir product to improve their ability to predict locations of improvised explosive devices in its war in Afghanistan. A small number of practitioners reported it to be more useful than the United States Army's program of record, the Distributed Common Ground System (DCGS-A). California Congressman Duncan D. Hunter complained of United States Department of Defense obstacles to its wider use in 2012. Palantir has also been reported to be working with various U.S. police departments, for example accepting a contract in 2013 to help the Northern California Regional Intelligence Center build a controversial license plates database for California. In 2012 New Orleans Police Department partnered with Palantir to create a predictive policing program. In 2014, US Immigration and Customs Enforcement (ICE) awarded Palantir a $41 million contract to build and maintain a new intelligence system called Investigative Case Management (ICM) to track personal and criminal records of legal and illegal immigrants. This application has originally been conceived by ICE’s office of Homeland Security Investigations (HSI), allowing its users access to intelligence platforms maintained by other federal and private law enforcement entities. The system reached its "final operation capacity" under the Trump administration in September 2017. Palantir has been pivotal for the International Atomic Energy Agency (IAEA) to verify if Iran is in compliance with the 2015 agreement. Palantir hosts Palantir Night Live at Palantir’s McLean and Palo Alto offices. The event brings speakers from the intelligence community and technology space to discuss topics of common interest. Past speakers include Garry Kasparov; Nart Villeneuve from Information Warfare Monitor; Andrew McAfee, author of Enterprise 2.0; Nelson Dellis, memory athlete; and Michael Chertoff. I2 Inc sued Palantir in Federal Court alleging fraud, conspiracy, and copyright infringement over Palantir's algorithm. Shyam Sankar, Palantir’s director of business development, used a private eye company as the cutout for obtaining I2's code. I2 settled out of court for $10 million in 2011. In 2010 Hunton & Williams LLP allegedly asked Berico Technologies, Palantir, and HBGary Federal to draft a response plan to “the WikiLeaks Threat.” In early 2011 Anonymous publicly released HBGary-internal documents, including the plan. The plan proposed Palantir software would “serve as the foundation for all the data collection, integration, analysis, and production efforts.” The plan also included slides, allegedly authored by HBGary CEO Aaron Barr, which suggested “[spreading] disinformation” and “disrupting” Glenn Greenwald’s support for WikiLeaks. Palantir CEO Karp ended all ties to HBGary and issued a statement apologizing to “progressive organizations… and Greenwald … for any involvement that we may have had in these matters." Palantir placed an employee on leave pending a review by a third-party law firm. The employee was later reinstated. On September 26, 2016, the Office of Federal Contract Compliance Programs of the U.S. Department of Labor filed a lawsuit against Palantir alleging that the company discriminated against Asian job applicants on the basis of their race. According to the lawsuit, the company "routinely eliminated" Asian applicants during the hiring process, even when they were "as qualified as white applicants" for the same jobs. Palantir settled the suit in April 2017 for $1.7 million while not admitting wrongdoing. During questioning in front of the digital, culture, media and sport select committee, Christopher Wylie, the former research director of Cambridge Analytica, said that several meetings had taken place between Palantir and Cambridge Analytica, and that Alexander Nix, the chief executive of SCL, had facilitated their use of Aleksandr Kogan's data which had been obtained from his app "thisismydigitallife" by mining personal surveys. Kogan later established Global Science Research to share the data with Cambridge Analytica and others. Wylie confirmed that both employees from Cambridge Analytica and Palantir used Kogan's Global Science Research data together in the same offices. ^ Hardy, Quentin (May 31, 2014). "Unlocking Secrets, if Not Its Own Value". The New York Times. Retrieved 2015-01-19. ^ a b Buhr, Sarah (December 23, 2015). "Palantir Has Raised $880 Million At A $20 Billion Valuation". TechCrunch. ^ a b c d Gorman, Siobhan (September 4, 2009). "How Team of Geeks Cracked Spy Trade". The Wall Street Journal. ^ a b c d "A Tech Fix For Illegal Government Snooping?". NPR. Retrieved 2012-01-30. ^ "Bloomberg - Are you a robot?". www.bloomberg.com. Retrieved 2019-02-21. ^ a b "A (Pretty) Complete History of Palantir". Maus Strategic Consulting. Retrieved 2014-04-27. ^ a b c d e f g Mac, Ryan (December 11, 2014). "Palantir Aiming To Raise $400 Million In New Round". Forbes. Retrieved 2015-02-21. ^ Copeland, Rob (2018-10-18). "Secretive Data Company Palantir Weighs Giant Public Offering". Wall Street Journal. ISSN 0099-9660. Retrieved 2018-10-19. ^ "SEC FORM D". Securities and Exchange Commission. Retrieved 2015-05-31. ^ "Palantir Knows Everything About You". Bloomberg. Retrieved 23 April 2018. ^ Greenberg, Andy; Mac, Ryan (August 14, 2013). "How A 'Deviant' Philosopher Built Palantir, A CIA-Funded Data-Mining Juggernaut". Forbes. ^ "charlierose". Media.palantirtech.com. Retrieved 2012-01-30. ^ "Palantir Technologies | CrunchBase Profile". Crunchbase.com. Retrieved 2012-01-30. ^ "Palantir « Founders Fund". Founders’ fund. Retrieved 2012-01-30. ^ Evelyn Rusli (2010-06-25). "Palantir: The Next Billion-Dollar Company Raises $90 Million". TechCrunch. Retrieved 2012-01-30. ^ a b "Alexander Karp". Charlie Rose. 2009-08-11. Retrieved 2012-01-30. ^ Widman, Jeff (2009-06-05). "Palantir keeps it lean and mean on five-year journey from zero to 150 employees". VentureBeat. Retrieved 2012-01-30. ^ Gesher, Ari (2010-03-08). "Friction in Human-Computer Symbiosis: Kasparov on Chess". Palantir tech. Retrieved 2012-01-30. ^ a b c Chiang, Oliver (2010-04-30). "PayPal-Based Technology Helped Bust India's And The Dalai Lama's Cyberspies". Forbes. ^ Markoff, John (March 29, 2009). "Vast Spy System Loots Computers in 103 Countries". The New York Times. ^ "Press release: Thomson Reuters and Palantir Technologies enter exclusive agreement to create next-generation analytics platform for financial clients". Thomson Reuters. 2010-04-12. ^ Tim Kauffman (2010-06-27). "The new high-tech weapons against fraud". Federal Times. Retrieved 2012-01-30. ^ Kiely, Kathy (2010-06-18). "Obama administration to create 'do not pay' list to bar shady contractors". USA Today. ^ Peter Orszag, Director (2010-06-18). "Do Not Pay? Do Read This Post". Whitehouse.gov. Retrieved 2012-01-30. ^ a b Eric Kuhn (June 1, 2010). "Companies capitalize on 'open government'". Political Ticker blog. CNN. Retrieved September 28, 2013. ^ "Using Palantir with Open Source Data: Finding and Preventing Fraud in Stimulus Spending". Palantir Technologies. 2010-05-04. ^ a b c d e f Burns, Matt (January 11, 2015). "Leaked Palantir Doc Reveals Uses, Specific Functions And Key Clients". TechCrunch. Retrieved 2015-02-21. ^ "Notice of Exempt Offering of Securities". The United States Securities and Exchange Commission. September 27, 2013. Retrieved September 28, 2013. ^ Cutler, Kim-Mai. "Palantir Is Raising $197M In Growth Capital, SEC Filing Shows". TechCrunch. ^ "Palantir raising more money after tagged with 15 billion valuation", The Wall Street Journal, Jan 16, 2015 . ^ Alden, William (June 23, 2015). "Palantir Valued At $20 Billion In New Funding Round". Buzzfeed. Retrieved June 23, 2015. ^ Buhr, Sarah (December 23, 2015). "Palantir Has Raised $880 Million At A $20 Billion Valuation". TechCrunch. ^ Condon, Stephanie. "Palantir acquires data visualization startup Silk". Retrieved 10 August 2016. ^ "AnalyzeThe.US — Home". Web site. Palantir. Retrieved September 28, 2013. ^ "Palantir Technologies to Showcase Analysis at the Community Health Data Initiative Forum: Harnessing the Power of Information to". FierceHealthcare. 2010-06-02. Retrieved 2012-01-30. ^ "Mark Elliot's answer to What are the main differences between the Palantir Metropolis and Gotham platforms? - Quora". www.quora.com. Retrieved 2019-02-28. ^ "Palantir Stops Mocking Salespeople and Starts Hiring Them". www.bloomberg.com. Retrieved 2019-02-28. ^ Chapman, Lizette. "Palantir once mocked the idea of salespeople. Now it's hiring them". latimes.com. Retrieved 2019-02-28. ^ a b c d e Waldman, Peter; Chapman, Lizette; Robertson, Jordan (April 19, 2018). "Peter Thiel's data-mining company is using War on Terror tools to track American citizens. The scary thing? Palantir is desperate for new customers". Bloomberg. Retrieved April 24, 2018. ^ a b c Mak, Aaron (April 19, 2018). "Report: Palantir Helped JPMorgan Spy on Employees". Bloomberg. Retrieved April 24, 2018. ^ Sidel, Robin (February 10, 2015). "First Data Reports First Quarterly Profit in More Than Seven Years". Wall Street Journal. Retrieved 2015-02-25. ^ "A Human Driven Data-centric Approach to Accountability: Analyzing Data to Prevent Fraud, Waste and Abuse in Stimulus Spending: Gov 2.0 Expo 2010 - Co-produced by UBM TechWeb & O'Reilly Conferences, May 25 - 27, 2010, Washington, DC". Gov2expo.com. Retrieved 2012-01-30. ^ "Merck KGaA, Palantir's new joint venture looks to tear down cancer research data silos". MobiHealthNews. 2018-11-20. Retrieved 2019-02-27. ^ "Airbus believes its AI can eliminate flight delays". VentureBeat. 2018-10-23. Retrieved 2019-02-27. ^ Palantir. "Palantir Foundry Enables Scuderia Ferrari Through Data". www.prnewswire.com. Retrieved 2019-02-27. ^ Knox, Karin (January 24, 2014). "How Many Years A Slave?". Archived from the original on March 4, 2016. ^ "With $7M contract, NIH taps big data analysis platform Palantir to streamline health research". MobiHealthNews. 2018-09-24. Retrieved 2019-02-28. ^ "Can Data-Crunching Palantir Find Missing Children and Catch Traffickers?". Fortune. Retrieved 2019-02-28. ^ "Palantir and WFP partner to help transform global humanitarian delivery | World Food Programme". www1.wfp.org. Retrieved 2019-02-28. ^ Scarborough, Rowan (July 16, 2012). "Military has to fight to purchase lauded IED buster". The Washington Times. Retrieved September 29, 2013. ^ Blagdon, Jeff (June 29, 2013). "Palantir is helping California police develop controversial license plate database". The Verge. ^ Ali Winston (February 27, 2018). "PALANTIR HAS SECRETLY BEEN USING NEW ORLEANS TO TEST ITS PREDICTIVE POLICING TECHNOLOGY". The Verge. ^ Woodman, Spencer (March 2017). "Palantir Provides the Engine for Donald Trump’s Deportation Machine". TheIntercept_. Retrieved 5 November 2018. ^ Tirone, Jonathan (May 7, 2018). "Peter Thiel and Palantir Are at the Heart of the Iran Nuclear Deal". Bloomberg News. Retrieved May 8, 2018. ^ "Society 2.0: Tenet, Chertoff and Beer, Oh My! | Washington Life Magazine". Washingtonlife.com. 2010-04-09. Retrieved 2012-01-30. ^ a b Harris, Shane (31 January 2012). "Killer App". Washingtonian. Retrieved 14 March 2012. ^ James Wray and Ulf Stabe. "Data intelligence firms proposed a systematic attack against WikiLeaks". Thetechherald.com. Retrieved 2012-01-30. ^ "COMPLAINT FOR VIOLATIONS OF EXECUTIVE ORDER 11246" (PDF). United States Department of Justice. ^ Kosoff, Maya (September 27, 2016). "U.S. GOVERNMENT SUES PETER THIEL'S SECRETIVE BIG-DATA START-UP FOR DISCRIMINATION". Vanity Fair. Retrieved October 31, 2016. ^ Kravets, David (26 April 2017). "Palantir settles US charges that it discriminated against Asian engineers". Ars Technica. Retrieved 26 April 2017. ^ Pegg, David; Cadwalladr, Carole (March 27, 2018). "US data firm admits employee approached Cambridge Analytica: Palantir confirm employee 'engaged in a personal capacity' with the company". The Guardian. Retrieved April 23, 2018. ^ Confessore, Nicholas; Rosenberg, Matthew (March 27, 2018). "Spy Contractor's Idea Helped Cambridge Analytica Harvest Facebook Data". New York Times. Retrieved April 24, 2018.